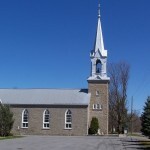 St. Philip’s is the oldest English-speaking parish in the Archdiocese of Ottawa and since 1818, it has been the religious, social and cultural centre for Catholics in the area. The parish has links to several early nineteenth century historical figures: Bishop Alexander Macdonell, Reverend Father Herron, and George T. Burke. The first wooden church was built in 1825 when the village was in its infancy, was burned by arsonists in 1857 during a time of religious upheaval in the county, and replaced by the current stone structure in 1858 at the height of Richmond’s prosperity. The parish played an important role in the early development of the Richmond settlement. In 1819 Bishop Alexander Macdonell, the highly respected leader of the Glengary Settlement, delivered the first sermon to parishioners in the village schoolhouse. Reverend Father Herron was the first regular pastor and led the parish when the wooden church was built in 1825. As an itinerant priest he carried a large responsibility at a time when English-speaking priests were scarce in Upper Canada and by 1829 he was transferred to Bytown to care for the Irish Catholics working on the Rideau Canal. At mid century the parish still covered a huge area: most of western Carleton County and the eastern part of Lanark. George Thew Burke, the Superintendent of the Richmond Settlement, is probably the most notable early settler buried in the Catholic cemetery. A veteran of the Battles of Queenston Heights and Waterloo, Burke was not only the Superintendent of the entire Settlement but postmaster, magistrate, and colonel of the 3rd Regiment of the Carleton militia. From 1821 to 1829 he represented Carleton County in the Legislature of Upper Canada. While key Catholic figures helped develop the village in the 1820’s, by mid century, the Catholic community was intent on protecting itself. This was a turbulent period in Upper Canada, marked by conflict between some members of the Orange Lodge and some Irish Catholics. On the Twelfth of July 1838, a militant Orange demonstration was marked by the intimidation of local Catholics who complained to the government at their treatment. In August 1857, St Philip’s was set on fire by arsonists. 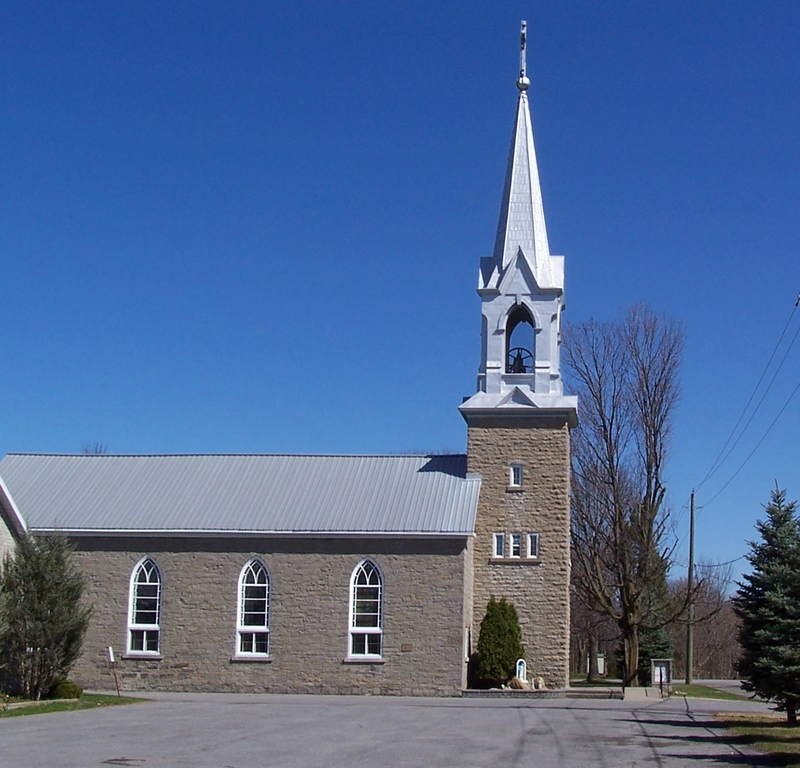 Showing its determination to maintain its position in the community, the parishioners built the current limestone building which was completed in 1858. It is presently the oldest church building in the village. 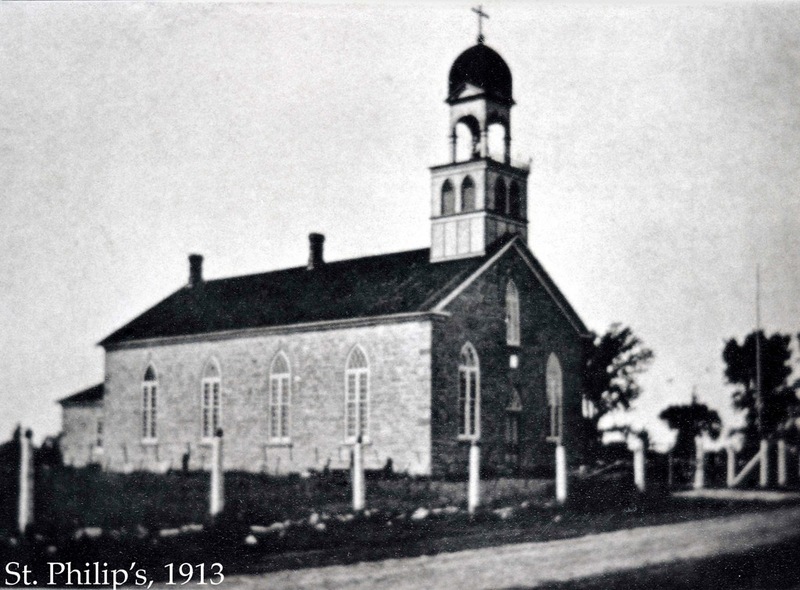 Throughout the remainder of the nineteenth and twentieth centuries, St. Philip’s continued to be the centre for Catholicism for the villagers and farmers in Goulbourn and much of Marlborough Townships. The Rectory to the east of the church was built in 1944 after fire destroyed the original building. The original limestone building was a simple rectangular box with some Classical features such as the central entrance in the gabled façade. It had several features from the Early Gothic Revival such as the arched windows, 3 bay façade, a central entrance tower rising within the perimeter of the building, and the subdivision of the windows into smaller elements by decorative tracery. 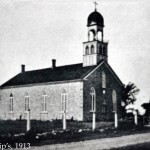 Riedel noted the changes made after 1913: the addition of the protruding tower, a new and different spire and changes to the windows. “The Architectural Heritage of the Rideau Corridor” Parks Canada Papers in Archaeology & history no. 10. Curry, John. Richmond on the Jock. Stittsville: The Stittsville News, 1993. GTHS (Goulbourn Township Historical Society) digital archives. Graham, Mildred et al. Richmond “150” Yesterday and Today 1818-1968. Ottawa:1968. Illustrated Historical Atlas of the County of Carleton including Ottawa 1879 H. Belden & Company. Oshawa On: Wilson’s Publishing Co., 1997. Kalman, Harold. A History of Canadian Architecture. Vol.1.DON mills: Oxford University Press, 1994. Walker, Harry and Olive. Carleton Saga. Ottawa:The Runge Press, 1968. This entry was posted in churches, Locations and tagged Church. Bookmark the permalink. Am Looking for early records of the church of St. Philip, in particular for the Kitt/Kitte/Kitts Family, is there anything online?